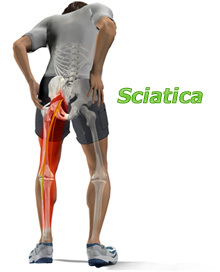 Sciatica is leg pain that is usually related to the sciatica nerve. This nerve runs from the lower back and reaches down to the ankle and feet by the way of the back of the legs. Usually people in the age group of 30-60 suffer from sciatica nerve pressure. If you suffer from lower back pain that extends down your leg, your first step on the road to pain relief is learning more about sciatica, it’s cause and treatments. The main cause of sciatica pain is usually damage or compression on the sciatica nerve. In older age group this problem is usually caused by disorders like spinal stenosis that leads to spinal degeneration. In this type lumbar spine problems the sciatica nerve pathway is narrowed which causes the compression or irritation of the nerve. The other major cause are slipped discs, which are also known as a disc prolapse. This condition usually occurs when the gel-filled soft disc present between the vertebrae in the spine ruptures which in turn leads to the irritation of the sciatic nerve. Muscle spasm is another reason for sciatica. Other less common causes include tumors and infections. Factors such as smoking, being overweight as well as pregnancy may also increase the likelihood of sciatica and leg pain. However, there are certain cases where no specific cause for sciatic pain can be identified. Diagnosing sciatica with the help of studying the symptoms is usually very common. Usually the patient suffering from sciatica suffers from pain that can range from being mild to extremely severe. Sciatica pain is usually described as a burning sharp sensation that induces cramp like pains. Apart from this the patient also suffers from numbness and weakness as well as tingling and pin and needles sensation in the ankle, feet and buttock. The patient also suffers from pain in the lower back and hip that trickles down to the back of one leg. Usually pain occurs in the early days of the condition and it improves considerably with time and totally disappears within 12 weeks. However, in severe cases sciatica can lead to progressive weakness in legs as well as loss of bowel and bladder function. This is when doctors may recommend surgical procedures. out what options are available in resolving your back pain. Back surgeries include various treatments and procedures that a specialist suggests after carefully examining the cause of pain as well as the medical history of the patient.